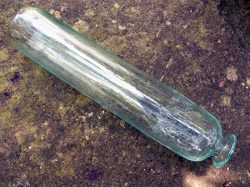 English Victorian hand blown glass Cucumber Straightener circa 1880. In perfect condition. Glass faintly greenish colour. Contains a patination of plant residue. A very rare museum piece in great order. Length 14 inches (36cms).